I have been pretty quiet here because I was traveling in the South of France. If you follow me on social media I am sure you have gotten an eye full of the gorgeous journey I was fortunate enough to go on I am going to be sharing some of my lessons, and loves from this trip. I am a bit of a slower processor so I needed some time to put all of the pieces together. I will be doing this over the course of a couple of emails in the next week or so. The reason I was in France was that I signed up last year for the Your Leadership Recipe Live event that was being offered by Makenna Held. She is also the owner of Julia Child’s home and runs the cooking school that they offer as part of the offerings connected with La Peech. You can find out more information about next year’s event here. What I knew to be true when I signed up is that how we show up in spaces where we are uncomfortable, is often how we show up in our leadership. I wanted to make sure that I was testing out my edges because I have some pretty important work in the world and it is requiring BIG LEADERSHIP capacity. What an omelet taught me. The first cooking lesson that we had was how to make a french omelet. What I learned quickly was that the egg mixture and the components were not as important as how I show up at the stove. It was easy to bring the ingredients to the pan and to watch the egg cook. 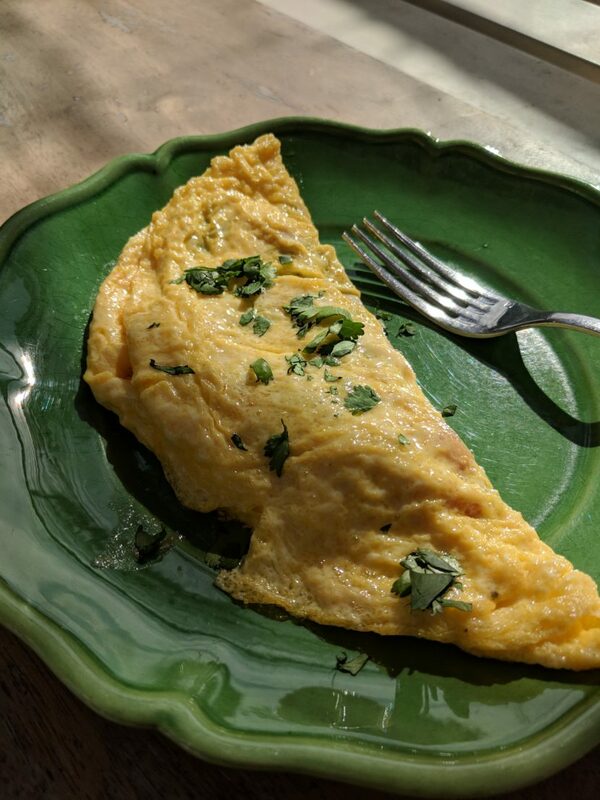 What was so hard for me to master was the way we were taught to shake and swirl the pan to cook the egg and then to JERK the pan towards us to get the omelet to fold. What I learned is that I had confidence in the ingredients, I had confidence even in the stove that it would do its job. Where I struggled was when I needed to be forceful and confident to get to the final step, a forcefully flipped omelet. I have taken this lesson with me and whenever I feel like I want to retreat or rely too heavily on the ingredients of my work I remember that they need me to direct them. My work needs me to show up confidently and yes sometimes forcefully to get it all moving in the right direction. Have you seen your leadership and confidence tested when you are testing yourself out at the edges? How did you show up? I am curious to know. More to come…France had many lessons. Dare to Lead Facilitator Training- I am currently finishing up Rising Strong and will test on it before moving on to Braving the Wilderness. Reading all of Brene’s Brown’s books and passing assessments is part of my pre-work for my training with her in June. The Three Whys-This little book that wrote itself will be released soon so stay tuned. We are working on the finishing touches. I have decided that for now, it will be an E-publication and for purchase on Amazon. Inner Kiddo to CEO- I will be writing more about this soon and would love to connect with people who are seeking speakers for their events and are tired of the same old boring business mindset talks. ⟵Does Your Business Design Include Emotional Sustainability?